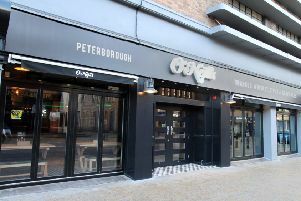 There promises to be a right royal occasion in store this weekend for Peterborough’s drinkers and diners, writes Brad Barnes. The city centre’s newest pub - the regally named Queen’s Head - opens on the equally majestic Queen Street tomorrow (Friday). As the photo shows, the Charles Wells pub has undergone quite a facelift since its days as the Clarkes restaurant. The classy fine dining interior - decor and furnishings -has been transformed from a beautiful swan to an ugly duckling! But it has not been by accident - it has been by design, the brewery going for a quirky, eclectic style as part of its “pizza, pots and pints” concept. The ground floor is a kind of cobble stone effect leading out through large bifold doors to the garden. The bar has been reshaped and extended and the main room is dominated by a huge wood fired pizza oven. There is lots of evidence of upcycling. Walls are decorated by all manner of stuff - and the ceiling has been cut out allowing light in from the first floor windows. There is a wall decorated in pages from old newspapers carrying stories about the Queen - and there also a large bust of her majesty. There is beer from the Charles Wells Brewery, but not exclusively. And the food - well there’s artisan pizza - plus a selection of “pots” with the likes of mac n cheese featuring with smoked haddock kedgeree and chili con carne and more.